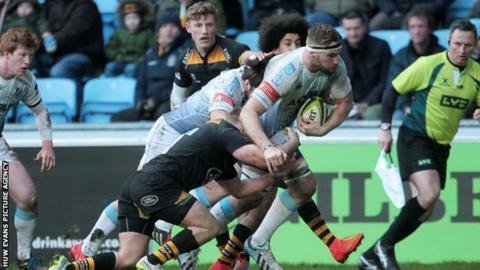 Lock Miles Normandale's last-gasp try, converted by Rhys Patchell, saw Cardiff Blues beat Wasps 45-42 in their LV Cup game at the Ricoh Arena. The result on Sunday saw Blues move to the top of Pool 2. Elsewhere, Exeter's Welsh contingent helped their side secure a semi-final spot with a 37-32 victory over Newport Gwent Dragons. Adam Hughes and Tom James both got on the score-sheet, while Ceri Sweeney kicked 12 points. The Chiefs's other tries came from Fetu'u Vainikolo and Sam Skinner as well as a penalty try from a five-metre scrum. Cory Hill, Luc Jones, Scott Matthews and Jason Tovey all crossed in the final half-hour, with Tom Prydie adding 12 points. Despite the two bonus points earned in the defeat at Rodney Parade, Dragons remain bottom of Pool 1.